Today, CONVERSE Inc. announces the global launch of a monumental new Converse Rubber Tracks program that opens the doors to some of the world’s greatest recording studios in music history. 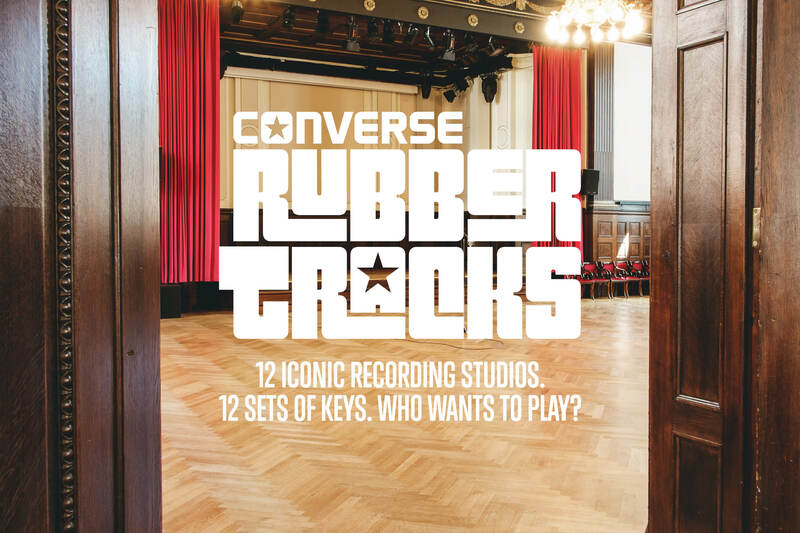 For ten consecutive days, Converse Rubber Tracks will activate across eight different countries in four continents, offering aspiring musicians the once-in-a-lifetime opportunity to record original music at 12 landmark studios, including the two Converse Rubber Tracks studios, at no cost. Global registration begins today, Tuesday, May 26 and runs through Wednesday, June 24, featuring an online submission process that requires applicants to rank their top three studio preferences, and encourages all to enter a brief artist biography or description via a video or written application. If selected, chosen artists will be notified in early July. Following a thorough planning session with studio producers, artists chosen will be taken to one of their studios of choice in September this year, with most travel accommodations arranged and select expenses covered by Converse. Starting today, emerging artists, bands, and musicians of all ages and genres across the globe can register for the rare opportunity to record at the following participating studios: Abbey Road Studios in London, England; Sunset Sound in Los Angeles, California; Hansa Tonstudio in Berlin, Germany; Tuff Gong in Kingston, Jamaica; Greenhouse Studios in Reykjavik, Iceland; The Warehouse Studio in Vancouver, Canada; Avast Recording Co. in Seattle, Washington; Stankonia in Atlanta, Georgia; Studios 301 in Sydney, Australia; Toca do Bandido in Rio de Janeiro, Brazil; the original brick-and-mortar Converse Rubber Tracks studio in Brooklyn, New York; and the second permanent Converse Rubber Tracks studio in Boston, Massachusetts, slated to open this summer. This Converse Rubber Track program will serve as the brand’s most innovative music initiatives to date, signifying the exponential growth and global expansion of the Converse Rubber Tracks platform, set to offer a total of 84 recording sessions at 12 different studios within a 10-day period. Selected artists will have the opportunity to work with world-renowned producers and sound engineers, while being given access to industry-leading technology in studios that have hosted some of the most celebrated acts in music history. The Converse Rubber Tracks program was born out of the brand’s desire to give back to the music community and provide opportunities for artists who might not be able to afford studio time. Since the flagship studio opened in Brooklyn in July 2011, over 900 emerging artists have had the opportunity to record original music alongside the Converse Rubber Tracks team of experienced engineers at no cost. At the end of their studio time, the artists retain all of the rights to their own music. Previous Post Mi Casa & Morgan Beatbox To Perform At First South African Nickfest!